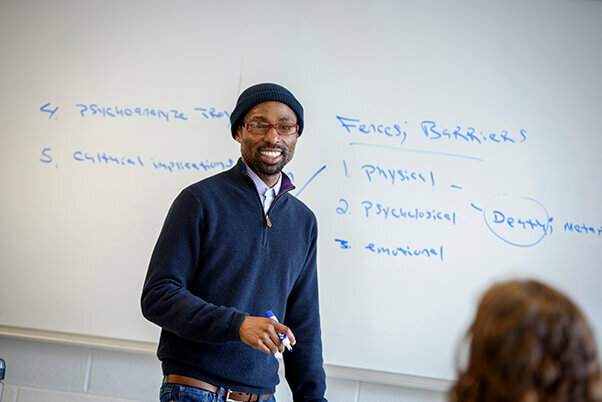 Three Rivers Community College is pleased to announce that Frederick-Douglass Knowles II, Hartford Poet Laureate and associate professor at Three Rivers, will be the keynote speaker at the College’s fifty-fourth commencement ceremony, which will take place on Wednesday, May 22 at 5 p.m. outdoors on the campus green. Frederick-Douglass Knowles II is a poet, educator and activist involved in community education. He is the inaugural Poet Laureate for the City of Hartford. In this role, he promotes awareness and appreciation of poetry, spoken word, and writing in Hartford; and endeavors to instill pride in the community. His collection of poetry, BlackRoseCity was featured at the 2018 Association of Writers & Writing Programs. Knowles’ works have been featured in the Connecticut River Review; Sinkhole Magazine; Poems on the Road to Peace: A Collective Tribute to Dr. King Volume 2; The East Haddam Stage Company of Connecticut, The 13th Annual Acacia Group Conference at California State University, Lefoko magazine, and Fingernails Across the Chalkboard: Poetry and Prose on HIV/AIDS from the Black Diaspora by Third World Press. His poem “Mason Freeman Cuts Jenkins Down,” has been nominated for a Pushcart Prize. Knowles is also an Associate Professor of English who has taught at Three Rivers for 11 years in the English and Communications Department. He also teaches classes at a local prison as part of the Three Rivers Community College Second Chance Pell Grant program. In addition to serving as the Three Rivers representative on CSCU’s Students First Consolidation Committee, he co-founded the Men Against Domestic Violence Artistic Expression annual event which consists of music, poetry readings and performances, and a live artist painting. Knowles also chairs the TRCC Community Involvement Committee.